It was “Experimental Wednesday” with the J-Golf group. We were in the golf lab on two fronts – playing under adverse conditions and dealing with human behavior and decision making. Six four-player teams competed with sustained winds of fifteen to twenty miles per hour. Gusts reached forty miles per hour. Keeping a golf ball in a straight line was all but impossible. In some situations, just placing the ball on the putting green meant chasing it down after the wind took it east. There were times when simply remaining upright was a formidable challenge; not everyone was successful. Adjusting for wind velocity became an issue even on short putts. In our golf laboratory, we looked at how the extreme conditions impacted golfer performance in general and in particular, which groups of golfers would be most impacted by the adverse conditions. One school of thought held that the low handicap golfers had the most experience and would be better equipped mentally and physically to adapt. The opposing school of thought argued that low handicap players would be prone to hitting their drives much longer than high handicappers and that the longer ball flight would yield control to the whims of nature for a much longer time and offer the potential for greater disaster. In the realm of human behavior and decision making, we threw in an experiment with pari-mutuel betting. If you’re a moralist, don’t get your knickers in a knot – this is not “gambling”; it is science. “Gambling” implies the existence of a random result. In this case, the goal of the participants was to apply all the deductive prowess available to deduce the correct outcome. It was interesting to observe that as the odds (as determined by the wager volume distribution) of any given team winning changed, the betting vectors swung wildly in one direction or another. To provide additional control to the overall experiment, teams were created where one team had an average handicap of three, another averaged twenty-one, and others fell somewhere in between. One group’s total handicap was half the handicap of one player in a competing group. The pre-match odds favored the lower handicap golfers. For the most part, bettors believed skill and experience would triumph. The long odds on some of the higher handicap teams did bring in some bets from those hoping for a good payout, but the two teams with the lowest handicaps dominated the betting. With twenty-three golfers in the field, only two played better than their handicaps, Bob Joselyn and Scott Hull, the 22nd and 23rd ranked players in the field by handicap finished tied for first place in the low net category with 64s. On the front nine, the team with the highest total handicap finished in first place. The team with the second highest handicap finished in second place. The team with the lowest handicap came in last. The results on the back nine weren’t much different from the perspective of statistically significance. Of the seven skins won, five of those seven went to players with handicaps well above the average. What can we conclude from these results? Frankly, probably a fair amount. However, if we’re going to try this experiment again with pari-mutuel betting, I’m not sure I want to share my conclusions. After all, I bet on the two teams with the highest handicaps. Good luck next time. They bring us into the world. They nurture us, feed us, take care of us. Our first hugs come from the women we call Mom. They wipe away our tears and tend our bumps and bruises. They are our protectors, our guardians. I’m not yet sure what went wrong, but yesterday’s Gender War didn’t go according to the script. The women squared off against the men in a series of head-to-head match play contests. The ladies prevailed. In the opening match, I faced the diminutive Phyllis Laschuk of Vancouver, British Columbia. I thought to myself, “This really isn’t fair. A man of my experience level charged with the task of abusing a wisp of a woman who would need to seek the shelter of her golf bag if the wind blew.” I only hoped I didn’t embarrass her; she seemed like such a nice girl. After five holes, I was four down. She turned me every which way but loose as she toyed with me. She carded a gross 73 on the day and buried my hopes of winning by the 15th hole. I felt like I was at the State Fair locked in a cage with a 700 pound wrestling bear. It’s a fine line between optimism and delusion and I wasn’t sure which side of the line she was on. I knew she had to hit a pretty good shot just to get it on the green. Putting it in the hole was beyond pipe dream. She put it in the hole! Harold had nearly eagled one of the toughest holes on the course and lost the hole to go three down with six to play. The air leaked violently from Harold’s balloon. He fought valiantly for the last six holes, but it was an exercise in futility. Things didn’t get much better as subsequent groups turned their cards in to the scorekeeper. The only matches the men really dominated were those where one man played against another. As the competitors warmed up on the range, one of the grounds crew captured a snake. It got away so I helped by running over and picking it up. I placed it in a box. The snake hissed at me and tried to bite me. At the time, I didn’t view the event as a portent of what was about to happen. Next time, I’ll let the snake run free and hope for the best. “Sugar and spice and everything nice”? Don’t be fooled. Put a seven-iron in her hand and you have created a ruthless predator. Here are a few pictures from the day’s event. You can click on any of the images to enter the “slide show” mode. It’s pretty rare that I pen a love column on a golf related site, but circumstances leave me little choice. I recently enjoyed the ill-fortune of developing a rather severe case of “golfer’s elbow”. In reality, it’s “tennis elbow” (yes, there is a difference), but I don’t play tennis and I do play golf. You work it out from there. It’s an extremely painful and debilitating ailment with a lengthy recovery period. Frankly, it’s a bit depressing to have to stay on the sidelines while everyone else (except Chet Schwartz who has the same problem) competes on the golf links. In my endless search for the silver lining, I have found points of light in the oppressive darkness of being on the disabled list. For example, with me out of action, Sandy Wiener can stop the financial bleeding he has experienced for years. He won’t have to pay me three times per week as his losses mount up in our longstanding personal Nassau. My golf ball expenses are down. I’ve got more time for my other pursuits. But by and large, I’m bummed. There’s something cathartic about taking your aggression out on a tiny little ball with a big stick even if the ball usually gets the best of the contest. The brightest light of all comes from the hearts of the players that make up our group of competitors. I’ve long said we’ve got a great bunch. That truth has become even more apparent when listening to the multitude of comments and words of encouragement in the wake of my misfortune. Not only has it been heart-warming, it has been entertaining beyond description. So many of them have offered caring suggestions as to how to treat the malaise so that I can return to golf as soon as possible. The variety of suggestions is reflected in the list below. The shot – cortisone. A powerful anti-inflammatory substance painfully injected into the elbow area. This is a particularly unappealing solution for a true trypanophobe such as myself. Consultation with an orthopedic surgeon. I have done this and the doctor selected prefers a very conservative approach involving six to nine months of rest followed by the possibility of surgery. This seems to call for a liberal application of common-sense, something I hold in rather short supply. Acupuncture – a process involving the insertion of not one, but many needles into one’s body. Another delight for a trypanophobe, but I have not ruled it out yet. Cream derived from marijuana. I now possess a small amount of this cream, but have yet to figure out how to roll it into cigarette paper. Marijuana itself – this “doobie therapy” offers potential, but I fear I’d go broke stocking my shelves with Hostess cupcakes and Twinkies. I’m also led to believe it leads to frequent derailments of one’s train-of-thought and my caboose already spends enough time in a ditch below the tracks. Naturopathic medicine. Hey – if it works, I’m all for it. However, I don’t know much about the topic and I’m not sure I’ve got the time to learn. Contraptions – Much of the advice I received involves the acquisition of things like braces, supports, slings. Some of them I now possess. However, the various “experts” with whom I come in contact confuse the hell out of me. For example, the forearm brace I have is to be worn all day, only when trying to swing a club, tightly secured, loosely secured, or not at all – depending upon the expert doing the talking. Work out regimens call for the use of a variety of devices. For example, the “Theraband Flexbar” allows me to torture myself into numbness. Admittedly, it’s not painful when you lose consciousness and that seems to be the direction this medieval device takes you. Physical therapy has been recommended by some. I’m pursuing this alternative and it seems to offer some promise. However, I find it interesting that it amounts to paying someone to tell me not to do most of the other things that have been recommended while she’s massaging the damaged parts of my arm. Other suggestions have included “don’t swing so hard”, “get new clubs”, “get new shafts”, “golf left handed”, and “give up golf altogether”. Get a curadero, a brujo, or a medicine man. At this point, the only thing I know for certain is that there’s no magic cure. It’s going to take some time. The best part of the situation is that the pain and discomfort is minimal when compared to the comfort and happiness that comes from knowing so many members of our golf group truly care about each other and want to help when someone is suffering. We’ve got an eclectic group with people from all different backgrounds, different walks in life, a range of philosophical bents, skill levels and ages. But the one thing they all seem to share is a fundamental love for humanity. The urge to help others in need is the hallmark of a good soul and we’re fortunate to have so many of them. Friday’s golf was as bad as Wednesday’s golf was good. They lit it up on the Ambiente course Wednesday, but it was the heart of the dark ages on the Padre course Friday. We needed one blind draw, but nearly everyone tried out for the part playing and putting as if blindfolded. The average score was more than six strokes higher than the previous match’s average. For those who believe Padre is easier than Ambiente, think again! Nonetheless, it was a great day for a walk. Here are some of the people I found in my meanderings. It was great to see one golfer get off the injured reserve list. Pat Collins played his first round in more than three months. Welcome back. As usual, a click on an image enlarges it and puts you in the slide show mode. Sometimes You Can’t Catch a Break – Sometimes You Can! Some great golf yesterday! Jack Summers carded a gross 79 and wasn’t within ten strokes of the lead! Chip Nelson shot a strong 68 (isn’t that redundant?) while Hans Birkholz and Mike Smothermon each recorded 75s. Lee Mitchell was right on their heels with a 78. But the round of the day was turned in by Ron Dobkin who fired a net 63 to take low net honors (and a lot of money). That should come as no surprise when considering that his partner, Hans Birkholz, turned in a net 64. Author h. Alton JonesPosted on February 14, 2019 February 27, 2019 Categories match results, News, Photo Galleries, scottsdale golfTags Camelback Golf Club, results3 Comments on Sometimes You Can’t Catch a Break – Sometimes You Can! Those of you that have weighed in on the conundrum of slow play will be pleased to know we’ve settled on the recommended solution. It’s a hybrid of one of the survey choices and a proposal submitted by one of our more creative golfers. This innovative solution is the synergistic product of the collective mind of our golf group not unlike the “invisible hand” of Adam Smith’s capitalism. As you’ll see, it’s also rather Darwinist in both its application and effect. Survey responses were nearly evenly divided between assessing penalty strokes to the offending group’s players and creating a public rating system for golfer’s pace-of-play history. I have invested a significant amount of time creating a computer generated “Pace-of-Play Ranking” system. Rankings will periodically be posted to the “Match Sign-Ups” page. I’ll be happy to share the mathematics behind the rankings upon request, but suffice it to say, they will become more accurate as system familiarity increases. I am NOT a slow player. That is pretty much the refrain heard from all golfers, especially the slow ones. But … if you’re not the slow player, then who is that slow player? Him! Of course! Who else? Obviously, someone’s estimate of his (or her) pace of play is in error. Here are a couple tricks for determining who that pokey player might be. Assuming that statistically, one out of four players is “slow”, look around your foursome. 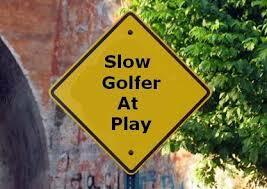 If the other three golfers are not slow, then it’s you. Look around your foursome. If the group in front of you isn’t impeding your pace of play and no one in your group is hitting the ball, then it’s you. Hit the damn ball. Play “ready-golf”. Someone, for crying out loud, someone hit the damn ball.